This poster is for Currys. The joke is that this guy is such a slob that instead of washing the dishes, he gets his dog to lick his plates clean. Fortunately, Currys offer next day delivery on their dishwashers, so his dog-plate-licking nightmare will soon be over. In my lifetime, I have probably spent about ten minutes standing in front of this poster. This is possibly more time than the people responsible for this poster expected anyone to stand and study it. It’s situated on the Central Line platform at Holborn station, so most people, if they bother looking at it all, will only see it in the minute-to-two-minute interval between trains. Although, in fact, that’s not true. I’d imagine a lot of people who travel on the Underground make the same journey every day. And a lot of them, travelling between the same two stations, will make a point of standing at approximately the same point on the platform each day. It might be the place closest to the exit at their destination station. It might be the point they’ve decided gives them the best chance of getting a seat. It might be a compromise between these two competing impulses, calculated according to some arcane logic known only to them. Whatever. Lots of people stand at the same point on the platform each day. And lots of those people are bored. They’re looking for some sort of distraction. They read the posters in front of them. They come to learn every word. They look at each detail of the image. I think getting a dog to clean all your dishes would be quite a time consuming way of doing the washing up. It would take the dog a while to do even just one plate. Surely much longer than just giving them a quick wipe. Of course, you could argue that the dog-licking-plate method, whilst time consuming, involves little active participation from the guy – the dog is doing all the hard work. This allows the guy to spend time reading instead. But, as you can see from the photo, holding a plate so that a dog can lick it clean isn’t the entirely passive action you might at first imagine it to be. It’s quite distracting. I bet he’s read the same few lines of that magazine several times and hasn’t really taken in a word. It might be because the dog-licking-plate method is so time consuming that this man has been forced to buy so many plates. I think it’s safe to assume that by putting him in a dressing gown, unshaven, with messy hair and with a load of washing up piling up around him, Currys are trying to suggest that this man lives on his own. But, for a bachelor, he has a lot of plates. It’s hard to tell from the picture, but I’d say there are somewhere between twenty-five and thirty plates there. Dinner plates. That’s a lot of plates. I would in fact argue that it is an unrealistically high number of plates. And he only has plates. Well, plates and cutlery. No glasses. No mugs. No bowls. Nothing. There’s no sign even of the pan in which he cooked the spaghetti. How did he cook it? Holding a plate full of water over the gas hob? Possibly the spaghetti was microwaved. But there’s no sign of a microwave oven either. In fact there are no appliances at all. I can accept that the fridge may be out of shot to the left. But that work-surface behind him – there’s nothing on it. No microwave. No toaster. No kettle. Nothing. There are two sockets on the wall behind him, neither being used. There’s not even a radio. Despite the crude caricature of this man’s bachelor lifestyle – undressed, unkempt – the sparse kitchen seems surprisingly clean. The white doors on the kitchen cupboards and drawers are all spotless. Perhaps he’s also trained his dog to lick the cabinets clean, although that would only work for the lower ones. It would be difficult to pick the dog up and get him to lick the doors of the upper cabinets too. I’m not sure if next-day delivery is a new service offered by Currys, but you can see they’ve tried to think of some amusing way of illustrating its availability. But I think every single thing about this advert is wrong. Even the tagline “Urgently need a dishwasher” doesn’t really make sense. He’s clearly been living like this for a while, if he’s now decided to get a dishwasher, he doesn’t need it immediately. No-one ever really needs a dishwasher immediately. You might decide to get a dishwasher, but you don’t need one urgently. Whatever system you already have in place to cope with your dishes (for most people, this system involves doing the washing up, for the man in the picture, it involves getting his dog to lick them clean) can hold out for a few more days until the new dishwasher can be delivered. He doesn’t even need a dishwasher at all. OK, he’s got a bit of a backlog, but once he’s worked through that, he should be OK. He’s only got plates to wash anyway. I have a dishwasher, but still use the dog-licking-plate method, because it does a lot of the preliminary work for you, removing the food from the plate before you wash it. You don’t actually have to hold each individual plate though, you can just leave them on the floor. In fact if he put down, say, five plates at a time, he could get on with other stuff while the dog was licking the plates. He’s adopted an unncessarily time-consuming method, for the purposes of this advertisement. Do you get Oscar and Rufus to clean the doors of the kitchen cabinets too? Maybe you could get them to clean the floor. Just smear some food all over your kitchen floor, and they’ll lick it clean. That’s an interesting idea. I mean, they do naff all about the house so it would be nice if they started earning their keep. He’s also saving money on dog food. 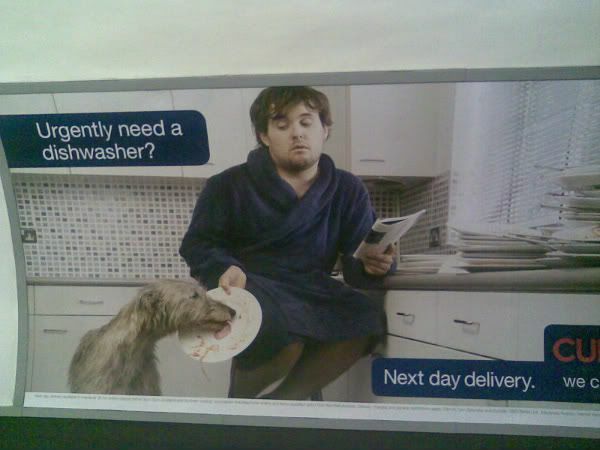 Yet I still want to buy a dishwasher, damn you advertising! I am that man. My hair isn’t that bad. And I happen to like the unshaven look. Regards. You have had your haircut since, Michael, but the unshaven look is still there.